Company’s Kanega offers independence, dignity, says JeanAnne Booth. AUSTIN, Tex. – With new funding in hand and a test underway, UnaliWear is poised to hit the market with its Kanega smart watch early next year. The company recently closed the first $2.1 million tranche of a $3.5 million Series A round of funding. The money will allow the company to move forward with market testing on 6,600 people. “Our first step is a 600-person user experience at the end of this month,” said JeanAnne Booth, UnaliWear founder and CEO. The initial test for the Kanega will include participants in the United States aged 23 to 97. 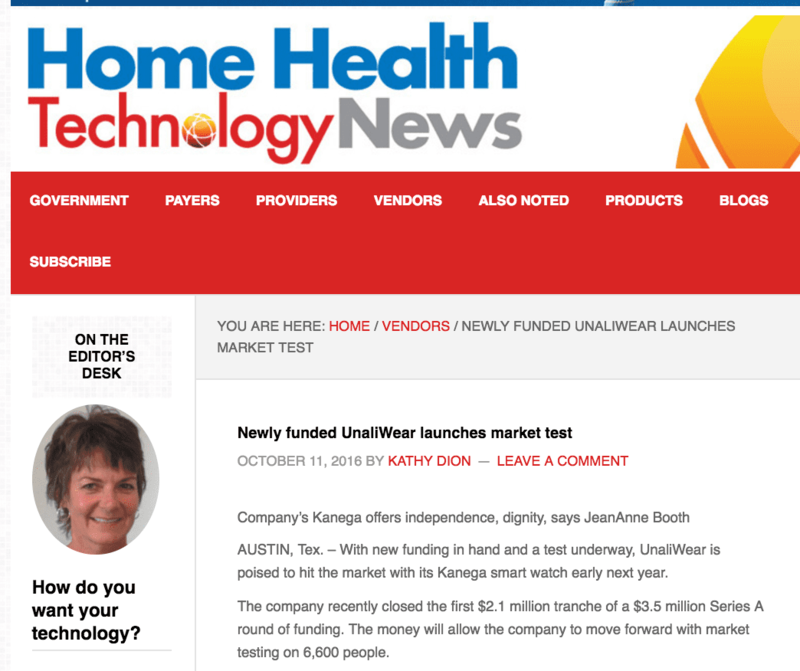 UnaliWear is targeting a large market for the Kanega—not just seniors, but people with Multiple Sclerosis, ALS, Parkinson’s Disease and Down syndrome, blind people and disabled veterans. “When we talk about vulnerable populations, people tend to automatically think of senior citizens, but it’s much broader than that,” Booth said. Connected by an AT&T cellular network, the Kanega looks just like a traditional watch, and uses an easy speech interface rather than buttons or touch screens. It learns the wearer’s lifestyle to provide predictive, pre-emptive support, such as directions home or notification of gait or speech changes that may be signs of a medical problem such as stroke. Booth developed the Kanega watch after her own mother wasn’t willing to wear available emergency alert products because she didn’t like the way they looked. “The big help button on most products is socially stigmatizing,” Booth said. The Kanega also features a patent-pending battery system in the band so wearers don’t need to take off the watch to charge it. The waterproof watch can also be worn in the shower, bath or pool. While the Kanega is worn on the wrist, Booth doesn’t think of her product as a wearable.